High-quality branded socks are universally beloved by all recipients. Promotional socks with your logo make for memorable personalized gifts at corporate events, trade shows, and even charitable functions. Not sure where to start? Check out our 2019 guide to personalized socks. We are happy to offer factory-direct bulk pricing on the most popular sock styles: thigh-high, knee-high, ankle, compression, tube, no-show, and crew. We'll help you design the perfect pair of custom socks. We will handle the design process to have your company & logo look their very best (you’ll always approve the final design!). We can customize and ship most styles as quickly as 15 business days. Looking to get some customizable promotional socks made with cool designs on them and a good quality fit? At iPromo, we've got you covered with a selection of interesting, funny, weird and wonderful sock designs that scream personality and charm. From colorful doughnut stack prints, to designs of your favorite superhero and everything in between - we've got it all! From Silicon Valley to Shark Week; See how custom socks have become one of the hottest promotional products. 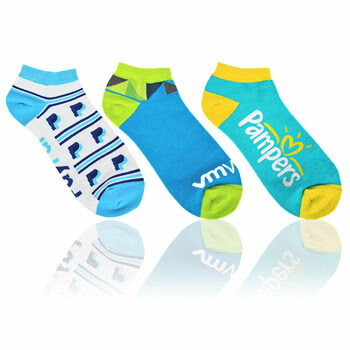 We can also help you to create your own promotional socks, complete with your company's logo design, colors and more, giving your company mobile advertisement every time you or a member of your team puts them on. Our socks are made with the highest quality materials to ensure long lasting durability, while the designs stand out with full color spectrum printing. Get our socks in different sizes - including knee high socks, ankle socks, foot liners, crew stitched and athletic socks to suit all your needs. Our custom socks are one-of-a-kind creations that will last you for years to come. No wonder they make great promotional gifts! Our prices are also very competitive, as we aim to provide a combination of quality and value that you'd be hard pressed to find anywhere else. You'll be glad to know that all our customized products come with a lifetime warranty and that we offer most of our samples for free. Need help on what to design? Our creative department is ready to help out with any and all ideas you have in mind. Take a look at the most popular designs below. If you see a particular style that you like, let us know and we'll be able to get your virtual proof put together quickly.